Experience From Games Is Back! A while ago, getting XP from games was added to Webo, but it got due to many glitches. Now, this function has been added once more, but doesn’t give out as much XP as it used to. The amount you get depends on your score and the game you’re playing. IF you encounter a glitch in any of the games, be sure to tell the Mods or Mio, because they’re still working on the games. Comments Off on Experience From Games Is Back! 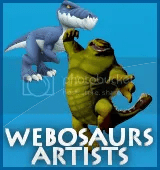 Webosaurs Expert Exclusive – Webosaurs Video! CLARIFICATION: this is not a commercial. This is a demo reel of the Webosaurs musician’s work. 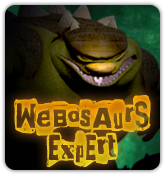 That’s right, we have a Webosaurs Expert exclusive. 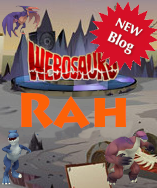 We found a never before seen video of Webosaurs by a staff member of Reel FX! Click the image to below to watch it. Wow! A lot of the art in that video was really cool. What do you think? Spike has left a message behind about some Blitz Attacks that will happen at the Geyser, but he has coded the information! In order to find out when the attacks will happen, we will have to break the code. If you have any suggestions, leave them as a comment here or just tell a Mod. It looks really tough, but it actually isn’t! Took me some time, but I broke it. What about you? Comments Off on Break The Code! Today we fought a really tough battle, but ended up with Okvango losing the first battle. After that, Mio gave us some info about the upcoming stuff. He said that This is BETA2 and we’re gonna have the XP from games back next week. He also said that there will be five whole battles tomorrow and confirmed that the Weekly Quests will come in two weeks. They will also be for all dinos. In addition to that, we’re expecting an new addition to the game as well! Today, I was going through Mio’s tweets and I saw something very interesting! A new dino! Could it be Parks or one of these characters bellow? Maybe it will be an entirely new character. On whose side do you think he/she will be? Share with us! Comments Off on New Dino Coming Soon! This weekend will be very intense! A secret group called the Webosaurs Spies, that has recently started forming around the island, gave away some info, that Spike is going to attack this weekend! From what we’ve been told so far, the Spies have teamed up with Linus, with their main goals being collecting intel on Spike and his plans and saving Webosaurs Island from devastation. There will also be a New Section in the Homepage, that will list the names of those dinos that have reported the most sightings and collected the most intel on Spike. What do you think about this new mysterious group? Share with us! We’ve all been wondering until when we’ll be stuck on level 4. Well, now we can all go further! I went to play some games today and when I returned to the Training Area, I noticed that I had become a new level! By playing another game, I found out that they were the reason for this sudden leveling up. EDIT: Leveling up through games has been disabled for now, because it’s glitched. It will be back up as soon as everything gets fixed. Comments Off on Level Up Through Games! In the new Blog post, Mio gave us some info about the weekly Quests. He said that “Starting in two weeks Linus will have a new quest each week as he tracks Spike’s movements and tries to foil all of his plans!”. He also said that things will change very rapidly over the next month. Comments Off on Weekly Quests Coming Soon! Enter to win a Webosaurs.com membership! I’ve been hiding away a $20 Ultimate game card membership (that’s redeemable on the NEW Webosaurs.com) for a while and I’m finally giving it away to celebrate the release of the newly born Webosaurs! It’s easy to enter, COMMENT your DINO NAME and EMAIL in a comment on this post. Then, in exactly one week from today (October 7th) I will put all of the dino names in a hat and I will select one dino name and that dino will win the $20 Ultimate game card! The winner can buy 3 one month memberships on Webosaurs or memberships to other virtual worlds if he/she chooses to do so! So what are your waiting for? Submit your comment now! One comment per player please! Need help with the quests? Click here! The Rise of Spike has begun and it has brought Webosaurs 2.0 to us! It’s finally here and everything is totally bluggin! The first thing you notice is the Training Area, which is the new start room. Then, we have the new Player Cards and inventory! Note: This is not my actual Playercard. It's edited, so that you can see how everything looks like. After that we have the Quests and Quest Givers (One of them being a new dino named Linus). Another awesome update are the Okvango battles! Every now and then a message will appear, telling you that Okvango is attacking. Once in battle you will need ammo to fight Okvango, which you can get from the Sling Shot Spot in the Training Area. Of course, we have a brand-new awesome homepage as well! Many quests (Weekly and in time even daily) will be added soon, battles will be fought, Temples will be discovered and so much more. It will all happen in time.